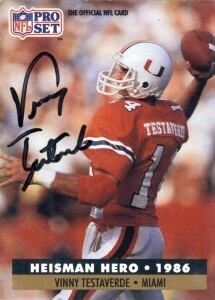 Vinny Testaverde was a Heisman Trophy winner while at the University of Miami in 1986 under head coach Jimmy Johnson. 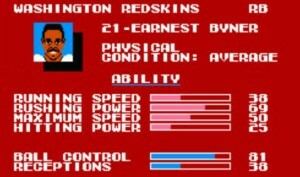 He’d declare as a Junior and enter into the 1987 NFL draft following the season. Testaverde would go #1 to the Buccaneers and would start 4 games during his rookie season. 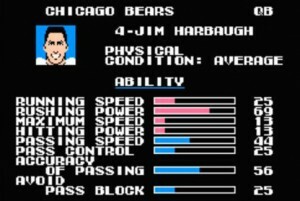 In 1988 he’d take over full time as the starter, to disasterous results, throwing for a modern day record of 35 interceptions and a 48.8 quarterback rating. (The 35 were the most since George Blanda from the AFL threw 42.) The good news was he was playing in Tampa- so nobody cared or had big expectations. Testaverde was also fortunate not to play in an age with an aggressive media, as quarterbacks are normally now given 3 seasons and are sent packing. Vinny would never, in 6 seasons with the Bucs, throw for more touchdowns than interceptions, nor win more than 6 games in a season. 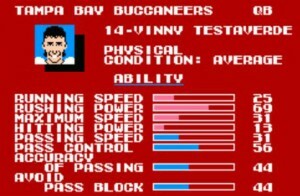 To say the least, nobody was really surprised when Vinny was allowed to leave Tampa. 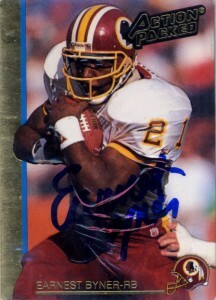 He’d sign with the Browns in 1993 and immediately turn his career around. His touchdown to interception ratio would flip, and he’d also post his first winning mark in 1994 with a 9-4 record, and transition with the Browns to Baltimore. Testaverde would also become better at making decisions, and despite Baltimore posting a 4-12 record in 1996, he’d throw for a career high 33 touchdowns and only 19 interceptions. 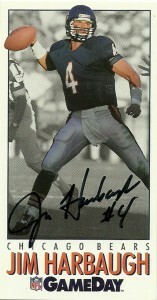 After the 1997 season, he’d sign with the Jets and playing under Bill Parcells, would post a 12-1 record, and throw only 7 picks in 421 throws, making him a crowd favorite. 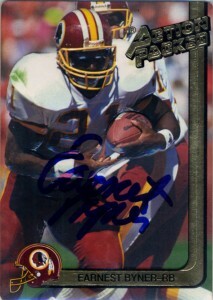 Injury would curtail his 1999 season, but he’d be back in 2000 leading the league in attempts with 590 throws, but also with 25 interceptions. After a pretty decent 2001 season in which he went 10-6, Testaverde would only start spottingly over the next 2 seasons, before he signed at the ripe age of 41 in 2004 with the Cowboys- and his old coach Bill Parcells. He’d lead the league in interceptions with 20, and then resign again with the Jets in 2005 where he hung on for the season playing in 6 games. In 2006, he’d play a season for the Patriots, and then finally get his wings and retire in 2007 as a backup for the Carolina Panthers at 44 years old, the second oldest quarterback in league history to take a snap. On the last play of the season he ran in and kneeled he ball to end the game, ironically on the home field of the team he started with- Tampa Bay. 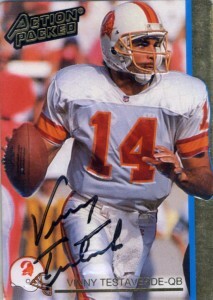 I got Vinny Testaverde’s autograph through the mail from the Tampa Bay Buccaneers the last season he was with the team. I also had his Starting Lineup action figure as well in that awesome candy orange. Vinny Testaverde is also color blind. It’s interesting to see how Vinny’s career ended up progressing. 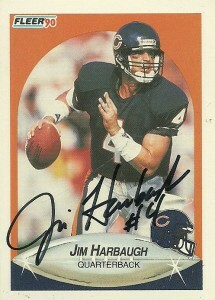 The franchise quarterback, turns into a hired gunslinger, then becomes a fan favorite and then an aged journeyman. In the end, even though he didn’t do it all right, Testaverde did have a somewhat storied career. The furthest he’d ever advance was the championship game while setting the modern NFL record for most losses by an NFL quarterback at 123. 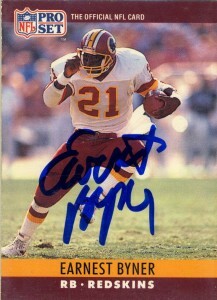 He also holds the NFL record: for throwing touchdowns to 70 different players and in 21 straight seasons. While his legacy remains clouded and his career ended up better than advertised, Testaverde will always be remembered for his tenacity and willingness to play through adversity.